Microsoft Exchange is one of the most prominent and popular calendaring systems around, and BusyMac has acknowledged that in version 2.5 of its BusyCal calendaring software for the Mac, adding extensive support for the service. BusyCal 2.5 supports multiple versions of Exchange, including Exchange 2007, 2010, and 2013, and also works with Office 365. Among the features that are implemented in the update are calendar sharing, which lets individuals calendars be shared among multiple people, each of whom can have a different level of privileges, such as read-only, read/write, the ability to set free/busy, and so on. Users can also subscribe to public organization-wide calendars, and those who organize meetings can see, at a glance, the availability of attendees when trying to schedule a time. Also included is support for syncing tasks via Exchange, and sharing those tasks with other BusyCal users. Tasks can either be set up to recur every so often—say once a week—or can be triggered to recur when the task is marked complete. In addition, BusyCal 2.5 supports push for Exchange calendars, meaning that when events are updated on the Exchange calendar, those changes are immediately reflected in BusyCal. 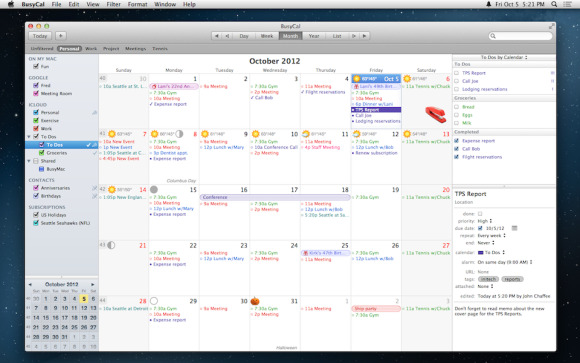 Event categories in Exchange are imported as tags for BusyCal calendars, and users can be notified for changes on shared calendars. BusyCal 2.5 is a free update for existing users, and it’s available to new customers for $30 from the Mac App Store; a 30-day free trial is available from BusyMac’s site. The app requires Mac OS X 10.8 Mountain Lion or later.